The new sales estimates, released Tuesday by mobile analytics firm Flurry, use the 74-day landmark because it's the amount of time that it took the original iPhone, launched in 2007, to cross the 1 million threshold. A year later, the iPhone 3G sold 1 million in its first weekend. For comparison, last November the Motorola Droid sold 100,000 units in its first weekend. "Despite the fact that the Google Nexus One is the most advanced Android handset to date, and enjoyed substantial buzz leading up to its release, the launch has been overshadowed by lower than expected sales," the firm said. "In our previous reports we offered several possible reasons including unconventional choices in marketing, pricing and distribution." Flurry said they believe the Droid bested the initial sales of the first-generation iPhone for a number of reasons. First, consumer perception and demand are vastly different than in 2007, when most users had a very different idea of a mobile computing device. In addition, the Droid launched on Verizon, which is a larger network with more subscribers than AT&T. 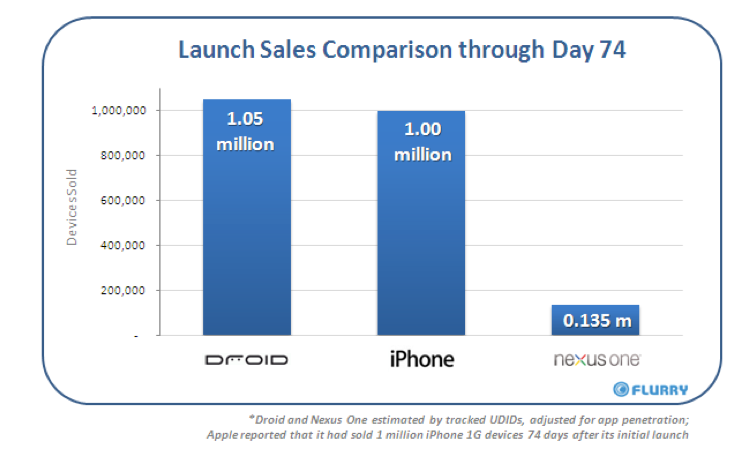 The device launch was also accompanied by a $100 million advertising blitz. Finally, Flurry said the Droid likely benefitted from being launched in the holiday season, while none of the first 74 days of sales for the original iPhone and the Nexus One fell during the holidays. "As Google and Apple continue to battle for the mobile marketplace, Google Nexus One may go down as a grand, failed experiment or one that ultimately helped Google learn something that will prove important in years to come," the firm wrote. "Apple's more vertically integrated strategy vs. Google's more open Android platform approach offer strengths and weaknesses that remind us of PC vs. Mac from the 1980s." Google unveiled the Nexus One in early January with an innovative approach, offering the unlocked device through direct sales. Though the device is available through T-Mobile for $179, it is also offered for $529 contract-free if users are willing to pay the premium. The handset is expected to launch on the Verizon network soon. When Apple sued handset maker HTC earlier this month, the Cupertino, Calif., company specifically cited the Nexus One as a handset it believes infringes on iPhone-related patents. With a firmware update the Nexus One was given multi-touch functionality much like the iPhone, an act that some believe led to the lawsuit.